Congrats to our winner - Jill McHale! It doesn't really seem possible. It seems like just yesterday that I was squealing in excitement about the opportunity to give away tickets to see Yo Gabba Gabba! I thought to myself, eh I don't need tickets myself this year for the Tower Theater- my kids have seen it. Yeah, Timmy still LOVES to watch his pals on tv (and took off to find it on Netflix as soon as he saw these pictures over my shoulder) but it wasn't that long ago that we got to see Yo Gabba Gabba Live! at the Mann Music Center. And then I scrolled through my picture archives to get some clips and OH MY GOSH!!! It was 2 1/2 years ago. Timmy was a BABY!!! 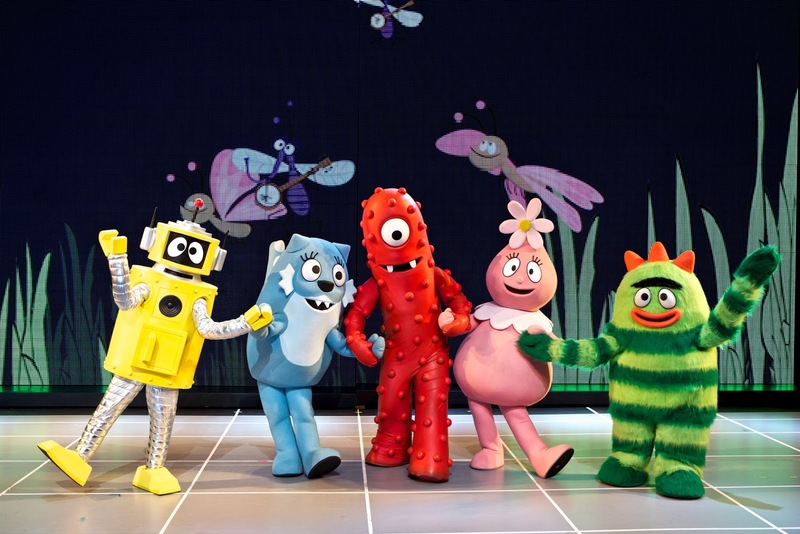 Whether your kids have loved Yo Gabba Gabba! for over 2 1/2 years, or are new on the scene, you are in luck because they are back in town, performing at the Tower Theater THIS month!! And not only do you still have a chance to purchase tickets, but you can win a family 4-pack right here. And it's not just a Party in Your Tummy, it's an all out party! The sillies are crazy little creatures that live inside of us and need to be shaken out! DJ Lance Rock and everyone’s favorite cast of colorful characters are calling all fans in Cincinnati to get ready to jump, shake and shimmy them out at the new live tour Yo Gabba Gabba! LIVE! : Get the Sillies Out!. Yo Gabba Gabba! LIVE! : Get The Sillies Out! tour will visit more than 50 cities across the U.S. in 2013. Yo Gabba Gabba! LIVE! is touring in support of their first national beverage launch, a new line of toys, a new line of kids sportswear and a DVD/ CD collectors' edition. Yo Gabba Gabba! LIVE! : Get the Sillies Out! will have two performances at the Tower Theatre in Upper Darby, PA on Friday, Jan. 25th (3pm and 6pm). CLICK HERE for ticket information for the shows. Tickets start at $26.00. VIP Party packages are available as well which include a ticket in the first 15 Rows, a pass to "Get the Sillies Out" in the private VIP room featuring a super fun party with the Gabba Gang (costumed characters) and more. Children under 1 year old do not require a paid ticket to sit on a parent's lap. *Simply leave me a comment to let me know who you would love to bring to the show. *Feel free to tweet this giveaway as much as you'd like for extra entries. Tweet must include @JulieBouf and a link to this post. If you have a non-reply google account or don't have a google account - include some way for me to contact you in your comment (e-mail address, twitter handle, etc...if I don't already know you personally). Please leave a separate comment for each entry. This giveaway will close on January 20, 2013. I would love to take my 2 1/2 year old! He has loved YGG since he was 6 months old! I'm sorry, I have no idea why my comment showed up so many times! This would be a perfect birthday present for my daughters 3rd Birthday! This would be a great date for me and my Reese! She never gets mommy alone time having 2 older sisters! Forgot to mention I would also bring my bff and her son! My two little cronies would like this. Thanks for the giveaway! I tweeted the give away. Fingers crossed! I would love to take my 3 year old daughter. She loves the Gabba gang!!! Thanks for the opportunity!